BBC article talks to Berners-Lee, Web still in it's infancy. I am still amazed it's only been around that long. In the Digital Web Mag, a good introductory article: Better Living Through Taxonomies, by Heather Hedden. From Ad Age: P&G Lets Consumers Act as Media Planners. Well, not exactly, but they can complain about media decisions. How that translates into non PC decisions remains to be seen.
" ... Last week, Procter & Gamble set up an option on its main consumer toll-free line (800 331 3774) in response to a drive from a coalition, dubbed Enough Is Enough, that was urging the company to stop sponsoring hip-hop programs on MTV and BET laced with profanity, liberal doses of the "N word," and scenes the group believes degrade and objectify women. This week, P&G set up a second toll-free option asking callers to register support or criticism of the "story line" on "As the World Turns," from P&G Productions, which featured fairly passionate kisses between daytime TV's only gay couple .... "
... the Retail Systems Alert Group (RSAG) recommended Flowcasting from Factory2Shelf as a methodology. I have seen this tested and it's useful for its sheer simplicity. 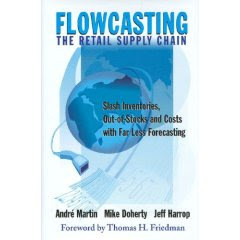 Flowcasting should not be seen as a means of future forecasting, but rather as a capability designed to eliminate the need for most forecasting by using demand data such as point-of-sale information. The companion site contains a good overview and the first few chapters of the book. provided here. Worth taking a look at. Gene Smith posts his slides for Five Emergent Trends in Tagging talk. He is the author of a new book on tagging I just received. Scary story, free webmail services are not secure. Not as bad as the headline seems to indicate. Robots with spinning blades should be paid attention to. Home tasks are hard to generally automate. I see that Stuart Kauffman, now with the University of Calgary, will soon have a new book out: Reinventing the Sacred: A New View of Science, Reason, and Religion. Look forward to it. We read a number of his early books when we developed complexity inspired models of supply chains. Surprising, since his models were mostly about simplifications of biology. An executive we worked with had read his 'At Home in the Universe ... ' several times, which led to lots of pressure to look at biologically inspired models of trucks. Inspirational from a philosophical point of view. Still waiting for the big modeling win.
" ... Despite decades of effort, image analysis remains a largely unsolved problem in computer science, the researchers said. For example, while progress has been made in automatic face detection in images, finding other objects such as mountains or tea pots, which are instantly recognizable to humans, has lagged. I mentioned the term Captcha in a recent post. The term refers to the distorted letters you are asked to interpret when you sign up for a new web service. The object of this is to detect that there is a human asking for the service, as opposed to a spam-spewing robot. The term is defined in a detailed article in the Wikipedia. It is not to be found at all in the premium version of the Britannica. Yes, I know this comparison may be unfair, the term is a somewhat obscure, fairly new (coined in 2000 the article says) technical term, and the WP excels at this sort of thing. Then there followed another, non technology, example. Britannica just sent out a set of topic articles, constructed from BT entries. One was about Ann Hathaway, Shakespeare's wife. Exactly 303 words long. I am a Shakespeare buff, and know there is relatively little known about her except her family ties. No technology here. Then I looked Hathaway up in the WP. Much longer article there, lots of links to recent related books and articles, including Germaine Greer's 2007 book: Shakespeare's Wife. By my non-historian analysis, a similar level of credibility about the few known and and some inferred facts. Nothing controversial I could see, writing clarity good. So there too, the WP won in overall value to someone that wants a credible but detailed overview. Once more, though, I don't want a winner, I want competing resources. Evan Schuman reports on Pizza Hut's Virtual Waiter Program. They say this takes data from millions of online orders and suggests add-ons to your order like Amazon does. Beyond the usual data, it also uses location from zip codes. What complex pizza ordering patterns exist in these orders remains to be seen. At the very least it exposes some of your other offerings to your customers, as effectual as a waiter saying 'would you also like an order of garlic sticks'? A common up-sell at restaurants. It's not like books ... to what extent does the fact that others order something with pizza influence you? They should soon have that data. - Do 9 out of 10 new product launches fail ? - Is recognition a better advertising metric ? ... "
I am a long time practitioner of business intelligence methods. In this week's Information Week a fairly good overview of the big players (SAP, MS, Oracle and SAP) in BI. The expense and sometimes narrow views of the big players is outlined. Its important to note that just because you have an ERP vendor buying a BI vendor, it does not mean you have the best way to deliver valuable BI. SAP comes to mind. Yes, data integration is important, but also valuable is to be able to deliver useful solutions, initially solutions that are fundamentally convincing, that can then be continually leveraged to more value. Business intelligence comes from first understanding an industry, then understanding the application of the simplest possible methods to improve it. The problem is still not solved. I do remember spam-like things on the Darpanet before 78. It took some time for Spam to show up in corporations. I wrote recently about the hacker cracking of Captchas, those distorted letter problems you see when you sign up for new online services. This is very serious since it has allowed the release of millions of spam messages from bots posing as people. I have also been looking at methods for identifying things in arbitrary images and using them to tag pictures with identifying descriptors. One of the most interesting approaches to this latter problem was developed at Penn State and is called ALIPR (Automatic Linguistic Indexing of Pictures) It's a fascinating mathematical programming method that can assign sets of tags to images. It turns out that this problem is one of the most difficult immediately practical AI problems known. It is also the case that the ALIPR approach to tagging photos is not perfect, where any particular tagging of a photo includes wrong tags. A recent Cyber Cynic blog post describes how the ALIPR method is being reapplied to the now broken Captcha method, with links to demonstrations of the method. For those with the math background, this paper gives a perceptive view of the ALIPR method. A Brewing industry Blog. Such industry covering blogs are useful to get a category introduction. Not sure it will generate any controversy. An overview of the problem of choice. Research appears to show that having too many choices can cause you not to purchase at all. Seems like a simplistic view, but this added to the cost of managing too many choices can lead management to reconsider complicating the shelf. A good online newsletter SIGevolution: Newsletter of the ACM Special interest Group on Genetic and Evolutionary Computation. Moderately technical view of applications in the field. A number of CG companies are getting together to understand how the future 'smart' home will influence their markets. Includes a positioning quote from Orly Cocco, P&G's future home innovation manager.
" ... The 2008 State of the Connected Home Market Study is being conducted under the auspices of the Internet Home Alliance Research Council, which is part of CABA, a not-for-profit industry association that promotes advanced technologies for the automation of homes and buildings in North America. The results of the study, which will conclude on May 30, 2008, are expected to be released to the public in January 2009. The study is being conducted by Zanthus, a market research-based consulting firm that serves high-tech companies ..."
The concept of the smart home is always very impressive to people, and much can be done with todays tech. Yet few people would want to pay the required current cost for what many see as frills. To what degree these capabilities will be embedded in the typical home remains to be seen. Eldercare applications, such as those being developed in Japan, seem more likely in the short-term. Also applications that will result in significant energy savings. In the Britannica blog: The Great Unbundling, by Nick Carr. Insightful pieces, newspapers and mags are getting thinner and different. He does a good job in exploring the difference between on and offline. Economic models. A week long forum will be providing responses to the article. Is the newspaper dead? More ephemeral than the printed book, which I think will be here for a while yet. Insightful post about the ever expanding information firehose. Brought to my attention by the atomiq blog. The author of that blog, Gene Smith, has a new book out called Tagging:People-powered Metadata for the Social Web , which I have on order. Have been looking at the tagging issue, and in the resources I have looked at, people don't tag things. I see that in MS's image manipulating programs there are explicit places for tags. On Amazon's Mechanical Turk there is a 'human intelligence task' that asks you to provide ten tags for arbitrary images. They will pay you $0.01 per image for the bother. Not a way to make a lot of money. ECommerce Times piece on options for laptop security.
" ... Tremor goes after a group called "connectors." "They are people who have social networks five to six times larger than normal people." What the agency does, among other things, is to tap into a network of several thousand connectors to find out what they think. "What we have learned in eight years is that there is a message the consumer wants to hear, and really doesn't mind [being subjected to] advertising as long as it's relevant," he says. But, he adds, in terms of campaigns intended to generate buzz, marketers are shooting themselves in the foot. "There is a message the consumer wants to share with friends, and it is always different than the advertising message." Knox said that two factors--advocacy and amplification--are intrinsic to the success or failure of campaigns meant to generate conversation among consumers. "The issues, for consumers, are 'why do I care? And if I do care how do I share?' There are brands that are amplified but nobody talks about them." Crest Strips, he says, are a good example. They have a lot of awareness, but nobody will want to say "Look at my teeth! Crest Strips did it!" ... "
Good short, general Forbes article on the market for RFID tags. Baby boomers are retiring and taking their knowledge with them. Why do so few in IT seem to care? ..."
I see that the CGT web site has been re-launched. A good source of consumer goods tech news and background pieces. The idea of putting some sort of display on a shopping cart has been around for some time. As part of my role running innovation centers I have seen a number of them demonstrated. The aim is to be able to talk to shoppers directly, with just the right message at just the right time. The problem is that most shoppers are not interested in lengthy interactions in front of the shelf. Retailers are not interested in complex devices that are costly to maintain and load with ads. Of all the devices I have seen, the Modstream idea, pictured here and mentioned below, is the most compelling. Not because it can show 60 second video ads on a screen, it cannot, but because it gives simple messages to shoppers, alerting them to what's happening in the store of value to them. It's also cheap to maintain, and can be managed remotely. It's good to keep it simple. 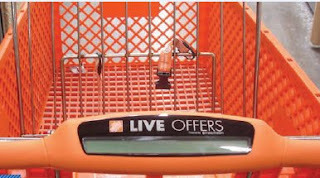 Retailers in the US using this new type of shopping cart, which displays text ads on a small screen on the handle, have reported a 35% increase in sales of featured products. Co-ordinated promotional messages can be set to run on trolleys across an entire chain of stores, and can easily be altered to review new products or offer discount alerts. Manufacturer: Modstream (www.modstream.com) ... "
TechCrunch reports that web publishers can apply for a free one year subscription to Britannica online. I used to be a BT subscriber, but let it lapse. I want alternative (hard to believe I am saying this about the Britannica) encyclopedias to survive. More recent evidence that a less formally edited encyclopedia like the WP is also selectively less objective makes me want this even more. Am I willing to pay even a token amount? As a publisher I want to be able to read it and link to it. Otherwise it's not a universal source. Update: I have taken advantage of this offer. Whenever I do a search on the WP, I will also do a search on the Britannica. I will report on my impressions. 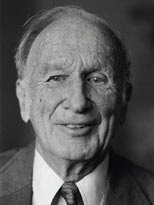 First example, the WP has a substantial article on Edward N. Lorenz, Chaos Theory pioneer, the Britannica has a brief paragraph on him, with no indication of his recent death. Edward N. Lorenz, A founder of Chaos theory, died this past week, his MIT obituary. I attended his lectures in the 70s and was very impressed by their implications. Methods in these areas have not yet seen as broad a practical application as expected then, but give us some insightful hints into how the physical world may be ordered, and how difficult it may be to predict precisely. Shel Holtz on American Airlines launch of a crisis blog. Paul Gillin calls it the World's Worst Corporate Blog. It does show how hard it is to blog about a tough corporate situation and bad news in general. Holtz argues against establishing a blog in a crisis and attempting to communicate with consumers that you have not already established trust with. Some high end digital cameras exist that have included GPS, this is apparently the first example of a consumer level camera with an integrated GPS and geotagging capability. You can use this to organize your photos on Google Earth and Maps and with Flickr. It can also allow you to put a 'pin' in any earth location by simply taking a picture there, leading to some useful nomadic application possibilities. In the WSJ Numbers Guy Blog, Good short piece, though I think its more often, despite the huge amounts of data that companies gather, the right data, gathered under the right circumstances that is hard to find. Think about the quality of data you need before you start gathering it. 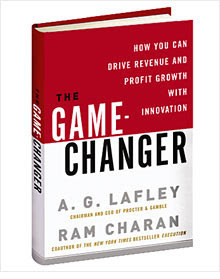 Time Magazine interviews P&G's A G Lafley's about The Game Changer book and innovation.
" ... We find a characteristic, high correlation in people who are naturally curious: the more things you're curious about, the more likely you're going to be an agile innovator or a contributing member of an agile innovation team. And then the last one is courage. I mean, there's a lot of uncertainty. Look at my industry, everyday household and personal-care products: 80% to 85% of the new ones fail ... ". Retail tech pundit Evan Schuman and I had a discussion about some examples he has come up with about the complexity of credit card transactions. These relate to who is responsible for different kinds of failures and frauds. The law has not caught up with the technology. Evan poses three instructive problems with the credit card system.
" ... If there's one thing that the last year of credit card catastrophes have made undeniable is that mixing credit cards, retailers, banks and card brands is unpredictable and a lot more complex than anyone wants to believe ... "
Tim Oren on the History of Wireless. It's on my list. This is what I was afraid was happening. I really would like to see an objective, balanced view of controversial scientific topics. If the editors don't want to assure that, who can? I noticed recently how many of my former colleagues were joining professional social networking groups. Unlike in the recent past it is now possible to link with people inside companies easily. Its becoming one big professional network. I have read several job descriptions that gave me views of what people were doing inside companies. It's a new blurring between home and business. More from Knowledge@Wharton: Gadgets at Work: The Blurring Boundary between Consumer and Corporate Technologies. In part its about the physical gadgets, but more importantly its about software and networks that fluidly and actively fill the gaps. Sometime ago I wrote about Qwaq, a virtual design space which akin to Second Life is a means to produce a virtual environment. In a recent WSJ article some of the work that's being done to produce more collaborative and private virtual worlds is outlined. These are kinds of simulations, with people in the form of avatars acting as a means to manipulate the worlds. Also within these worlds are simulations that portray real world interactions such as interpersonal interaction, expressions of design, inspection and analysis. Will these kinds of systems ultimately replace forms of remote collaboration? 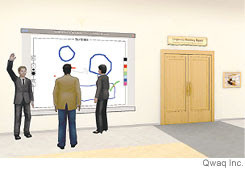 The big possibility is that they have the ability to include model design as well as models of a collaborative interaction in one virtual place. More than sharing a screen, with the third dimension included in an appropriate real world context. It remains to be seen if this is a better way to get work done. Evan Schuman writes about a new DVD kiosk that has a memory for consumers and can offer them rewards based on multiple interactions. Its the same idea that has been suggested for retail loyalty programs, but is rarely well implemented. The kiosk uses your e-mail address instead of a loyalty card for identification. It may suffer from the reluctance of the consumer to offer up their e-mail addresses without obvious assurance that it won't be misused.
" ... The more you exercise your willpower in one area the less willpower you have left for other purposes. In one pioneering study, some people were asked to eat radishes while others received freshly baked chocolate chip cookies before trying to solve an impossible puzzle. The radish-eaters abandoned the puzzle in eight minutes on average, working less than half as long as people who got cookies or those who were excused from eating radishes. Similarly, people who were asked to circle every “e” on a page of text then showed less persistence in watching a video of an unchanging table and wall ... "
Some companies are reporting the ability to read passive RFID tags at very long distances, up to one thousand feet. This will start to make it unnecessary to bring the tags on products, pallets or cases to the readers. Tagged objects could then be read from a distance. This may also cause increased concern about privacy issues, since short read distances for passive tags were seen as a protective characteristic. Long read distances may also increase security by allowing distant kill instructions to tags. 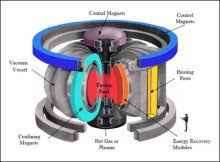 Good piece on the status and direction of fusion power. Lets hope we decide to go forward with these ideas without quivering about the risk like we have in the last 30 years over nuclear power. I am reminded that Prof David Goldberg has another active blog: The Entrepreneurial Engineer. Particularly interesting recent post, the slideshow/materials for part of his course: Creative Modeling for Technology Visionaries.
" ... Great special section on mobility and nomadism featuring quotes and insights from 3 august members of this group - Paul Saffo, Anthony Townsend and Jim Ware .... ". Contains some excellent stats on the use of wireless communications changing our culture. Saffo follows with a taxonomy of nomadism. An interesting case study of Unilever's use of Prism in Ad Age, and a comparison to work by TNS Sorensen. They say it implies that coupons and signs beat in-store tech. I would agree only in this very limited case, and for these particular executions. Execution is a very big part of any such comparisons. "... Unilever thought it had a great idea: Put ads for its Sunsilk hair-care products on supermarket freezer doors, because focus groups showed its target consumers like ice cream. The in-store programs found "most influential" by consumers in the study were, in order, in-store samples, package ads, coupon dispensers, in-store fliers and end-aisle displays. Those deemed least influential were ceiling ads, in-store audio and floor ads. Most of the newer media -- including cart ads, in-store TVs, video displays, checkout-lane ads and entryway ads -- ranked in the lower half of the 19 media considered ... "
" ... When Google launched its money machine — an advertising system called AdSense — it allowed anybody with a web presence to earn money by placing simple text ads on their sites. The volume of its distribution is so staggering that Google can charge the advertisers based solely on the number of people who actually engage with the ads by clicking. A quiet industry built around this has bubbled up, and AdSense is just the beginning. Now Google has announced free ad management software for websites, which will introduce all kinds of display ads to this same world. Anybody — read that anybody — can now sell advertising and run a complex rotating and targeting ad campaign on their website. 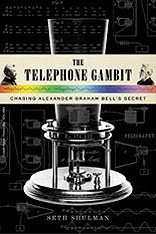 Once again, Google is by-passing Madison Avenue in building an extraordinary machine to help the process of buying and selling in our culture ... "
Seth Shulman's Telephone Gambit: Chasing Alexander Graham Bell's Secret, relates a first person view of his investigation into Graham Bell's precedence over Elisha Gray's telephone patent. I vaguely remembered pieces of the much repeated story, how Bell's patent was filed just hours before Gray's. Bell got the recognition and riches, though he had to endure seemingly endless patent challenges. Shulman starts by discovering the close similarity between a page in Bell's lab notebook and a confidential document that Gray filed with the patent office. He makes the case that this was the first time that Bell ever mentioned the specific technology approach that was eventually used in his patent. His theory is that a patent official revealed Gray's confidential document, either to Bell or his attorneys, that gave him a hint for a workable next step. Good read, which includes some additional background into a number of others that were looking at the concept of the telephone at the time, who also deserve more recognition for its development. Also a peek into how history is formed and re-formed, including the famous Bell and Watson 'aha' moment, now dutifully included in every history book. Another thing learned from the book was the term Whiggism, defined as writing history 'assuming knowledge that historical subjects would have lacked', or in a more compact way: 'reading history backward'. Important thought for those looking at the history of technology. Good story, compelling read, though since Shulman is not a professional historian, may get some criticism in that realm. I thought Shulman's argument was persuasive, but not everyone agrees. There is an article in the WP about the controversy that takes another view, placing the Gray precedence in the realm of conspiracy theories. Because Bell spent much of his life in Canada, this has also become an issue of national pride. Google aims to penetrate the Deep Web with HTML forms crawling ... In a move aimed at taking the search-engine giant closer to what's commonly called the "Deep Web," Google Inc. today said that it has started experimenting to find ways for its search engine to index HTML forms such as drop-down boxes and select menus ... ."
Though I am skeptical of the headline, we may be moving closer to losing the ad refuge of the mobile phone. Banner advertising on cell phones is reaching its target, especially female heads of households, according to the retailer's mobile arm ... ". From Knowledge@Wharton, podcast and interview: Saatchi & Saatchi's Kevin Roberts: 'It's All about Getting to the Future First'. Grant McCracken of MIT gives an interesting talk about his take on pattern recognition. According to the company, the chip is backward-compatible with the less-secure Mifare Classic chip, recently hacked by two research groups ... "
The Institute for the Future, which I have worked with since the early 80s, celebrates its 40th anniversary. It has revamped its web site, and relocated its blog. They have a novel way of understanding change. For more about their approaches I suggest Bob Johansen's book: Get There Early, which I previously reviewed. The domain name Pizza.com has been sold for $2.6 million. In the early days of the Web P&G bought a number of such names related to its products. I recall for example underarm.com and some seventy others. These were later auctioned off without much online use. Now, since most locations are found via search, more complex domain names are more common, and I would have thought such distinctive names were less valuable. Apparently not. I noticed a few weeks ago that some of my Gmail messages were being lost. A few were kicked back to me labeled Spam. And a few correspondents reported that my messages were being placed in their spam folder. Of course some people, like me, rarely look at their Spam folder, so they never saw my messages. Unexpected mail being lost. Disconcerting to say the least. Snail mail was becoming more reliable. Should I abandon Gmail? I searched around to figure out why. It turns out the the Captcha which Google uses to test to see if you are human when you apply for a Gmail account had been broken. So Spammers were getting Gmail accounts, and creating a new deluge of Spam. Spam filters were reacting by blocking some kinds of Gmail. For example a test showed that a Gmail message containing any kind of URL was more likely to be blocked than one without. Guess I have to wait for a solution. Better tests for human-ness are now needed. There is an excerpt of AG Lafley's book: Game Changer in Fortune. Back in 2000, P&G was stumbling; earnings, execution, and morale were all poor. Now this historic company, founded in 1837, is on a roll. How did it regain its footing? One key: getting to know its consumers better... "
Plan to read the whole thing. The buzz in the virtual worlds space is that Linden Labs, makers of Second Life, are joining efforts with IBM to create enterprise safe virtual worlds. Such worlds, which could exist entirely behind corporate firewalls, might be able to provide strongly contextual spaces that could improve aspects of training, innovation, collaboration and remote interactions among teams of employees, or among employees and their clients. Might it be the only way to run and apply the knowledge of a large multinational in the future? While IBM has made big investments in creating SL spaces that mimic real world enterprise spaces, I still don't see them as replacing the strength and warmth of human interaction. I have spent some time in SL, and the gaming aspect of virtual spaces and social interaction can me presented, but I don't see immediate enterprise value. Those that are thinking of doing this should read Joseph Weizenbaum's 'Computer Power and Human Reason', just commented on, which makes the point that fooling participants with interaction in a virtual world is not necessarily positive. I had a few interactions with IBM employees in SL that seemed like real knowledge exchanges, but we soon were so weighed down by the burden of the world itself, we decided that even an email exchange was more efficient. I am not saying this is not a useful research effort, only that while our computing and visual capabilities have improved considerably, they still don't provide the required capabilities to aid the enterprise. It does remind me of the AI effort of the 80s. Lots of perceived benefits, things that we can apparently do well, but are still years away from doing well enough to pay for the net effort. Is it only about being able to create really good visualization? Or is there much more to it? Good luck to Linden and IBM. Yet another article on Kimberly-Clark's use of virtual reality methods. " ... Safeway, the giant California-based supermarket chain and one of K-C's leading client/partners, is a prime example how the technically advanced approach helped transform a merchandising strategy. K-C settled with Safeway on an activity-based theme, reconfiguring baby products scattered in eight different areas of the sales floor into one area... " . Alex Pang reports on work that studies how people interact with their robot. 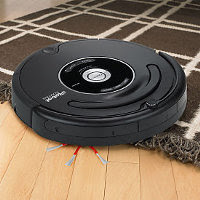 Notably the most common household robot of today, the IRobot Roomba. I would be particularly interested in how this kind of interaction compares with some of the human machine interactions reported in The Media Equation. Are there fundamental differences between symbolic representations on a screen and things that move around in the real world? The article seems to be mostly about how people bonded with robots, in perhaps not unexpected ways, by giving them names, etc. I would further like to seen how interactions between robot and people evolved. This may help us with robotic design and integration in the future. Original article. I have had a long time interest in genetic methods. The University of Illinois Genetic Algorithms Lab has a blog, run by correspondent Prof David E. Goldberg, that covers related topics and news. Lots of interesting recent links, including a pointer to an online text: A Field Guide to Genetic Programming. Just reminded myself of this blog's existence and placed it on my updated feeds. A colleague sends along an obituary of David Gale, a mathematician who pioneered early work in assignment problems, which find optimal matches based on established criteria. The successors of these methods now deliver best matches for the online dating services we see all the ads for today. More about the topic in a recent NYTimes article: Algorithms of Love. One thing that frequently came up during the fitting out of innovation centers, one of the things in the 'wouldn't it be nice' realm: Could we at any time easily determine where anyone is or where that piece of equipment was? All this is very possible to do today. RFID antennas can be put at every portal, everyone can carry a tag in their badge, important things can be tagged. After a discussion with the lawyers, and a determination of the cost, we decided not to. A culture of surveillance was talked about. Employees have rights of privacy. The data could be misused. Roland Piquepaille writes about a test underway at the University of Washington, including some video, that shows how this could work ... and some of the findings.
" ... describing Apple's software plan as the "third great platform" after the PC and the Internet. Think of it as the broadband Web plus a touchscreen TV in your pocket -- powered by the latest mobile TV entertainment software. Add all this to the growing library of professionally produced video content in the iTunes store and you might well have glimpsed a sneak preview of life after television ... "
I don't think that pocket devices, however elegant, will replace big screens, but portability does have advantages. What I would like to see is a portable device that could make use of any large screen nearby. Nicholas Carr overviews Joseph Weizenbaum's work. His 1976 book 'Computer Power and Human Reason' inspired and cautioned many of us. I recall reading it again during the heady artificial intelligence days of the late 80s. Made me think that delivering intelligence was harder than some of the proponents of AI were leading us to believe. His article points to a NYT obituary I had not seen. Good news for start-ups and coffee companies. A short piece on IBM using stochastic programming methods to model responses to natural disasters. It should be noted that contrary to what the article implies the term 'stochastic programming' is not IBM coined , but a well known set of techniques. Could seeing dogs on the way to work each morning influence what type of sneakers you buy? In a new research paper, Wharton marketing professor Jonah Berger makes the case that what you see in your everyday world can influence your choices as a consumer. In the paper, "Dogs on the Street, Pumas on Your Feet: How Cues in the Environment Influence Product Evaluation and Choice," the first part of the title refers to the results of an experiment in which participants who were shown repeated images of dogs were quicker to recognize the Puma brand, and liked its sneakers more, than those who had not seen the images. Confused? It turns out that dogs are associated with cats, and cats are associated with Puma.... "
Report on the effectiveness of corporate web sites. Trained as a scientist and an engineer, I never went through the 'case study' approach of the business school. Now it seems that many of the top business schools are starting to replace some of their case studies with more interactive simulations or games that can predictively present the outcome of various choices the players make. This is mentioned in the March 27 BW: The Sims: Executive Edition and a previous article on Virtual Workplaces in the Classroom. As an engineer I applaud the idea, with some caution. Just like Sim City cannot really be used for effective city planning, simulations cannot be used to construct completely realistic models of the real world. Model building, we were taught, is often more about what is left out of the model, than what is included. Simulations like this are not new in the business world. In the mid 70s, new marketers at P&G were trained with an economic simulation that helped them understand the relationship of marketing investments to sales. That worked well because it helped them understand all the issues involved and their relationships. It could also be operated in a group like a competitive game. 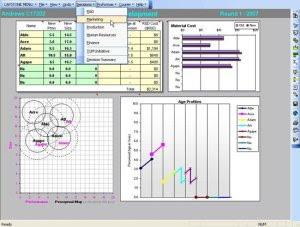 At the right is a more modern example screenshot of a system from the vendor Capsim. What we have now are better and faster graphical interfaces which can make it look like you understand the many entities in a real-world simulation and how they interact. Building a complete and accurate model that can predictively determine the results of choices made is much harder. I see this as a requirement that the model needs to be combined with a 'case study', which includes many of the non quantitative, softer aspects of business relationships needed to understand the real world. One way to do this would be to introduce ways to include intelligence concepts that combine hard and soft aspects of the system. The use of the models should also be more systematically brought into the business world. MBAs have been seeing less rigorous quantitative training over the last ten years. The use of simulations could lead students back into questioning the validity of the results they see. Or blinding following the predictions that simple models make! There is much work to do.
" ... The new gadget feature of Google Spreadsheets makes it easy to add heat maps. This can be used to create a world map illustrating the Googleshare for a given keyword across different countries; now-Google employee Douwe Osinga called this "Land Geist" a couple of years ago ... "
PROCTER & GAMBLE IS LAUNCHING a SKU of its Febreze brand for pets. The Cincinnati CPG giant will launch Febreze Air Effects Pet Odor Eliminator via a partnership with pet sites Dogster.com and Catster.com ... "
Steve King sends along a link to Shell's energy scenarios for the year 2050. Previously noted that Piggly Wiggly invented the self-service store. Now they are setting up a future format based on intuitive shopper behavior.